Keynote address by the Deputy Chief Justice Philomena M. Mwilu at the 5th Heads of Station Forum 2018. 25th – 29th March 2018. Mombasa. Keynote Address Deputy Chief Justice Philomena M. Mwilu at the 43rd Sheria Sacco Annual General Meeting. Crowne Plaza Hotel, Nairobi. 23rd March 2018. Speech by Chief Justice David K. Maraga during the launch of the National Committee on Criminal Justice Reforms (NCCJR). January 15, 2018. Speech by Chief Justice David Maraga during the launch of the State of the Judiciary and the Administration of Justice Report on December 15, 2017. Chief Justice David Maraga acceptance statement delivered during the occasion of receiving the ICJ Jurist of the Year Award, 2017. Talking points by the Chief Justice David K. Maraga, during the launch of the Mediation Settlement Week, December 4, 2017, Milimani Law Courts. Remarks by the Deputy Chief Justice Philomena Mwilu during the launch of the Judiciary Mediation Service Week, Milimani Law Courts December 4, 2017. Remarks by CRJ during the ceremony of receiving land title deed for Wamunyu Mobile Court. Speech by CJ Maraga when he received books worth Ksh 159m from World Bank JPIP Project. Speech by Chief Justice David Maraga during the Law Society of Kenya’s Annual Conference at the Leisure Lodge Beach & Golf Club, Mombasa. Statement by Hon. David K. Maraga, EGH, Chief Justice of the Republic of Kenya and President of the Supreme Court, on the Judiciary’s Preparedness for Elections Dispute Resolution. Remarks by the Deputy Chief Justice of the Republic of Kenya and Vice-President of the Supreme Court, Lady Justice Philomena Mbete Mwilu during the opening of the 2017 Judges Colloquium Mombasa. 3rd July 2017. Speech by DCJ at the swearing in of members of Communications and Multimedia Appeals Tribunal. Remarks by the CJ during the laying of Isiolo High Courts foundation stone. Remarks by Chief Justice David Maraga during the official opening of the IEBC Election Preparedness conference held today at KICC. The Hon. Justice David Kenani Maraga, Chief Justice and President of the Supreme Court of Kenya, during the launch of University of Nairobi’s School of Law Alumni Chapter and unveiling of the University’s Alumni Agenda 2020, at the University of Nairobi’s Chandaria Auditorium on the 8th June, 2017. Speech by Hon. Mr. Justice David K. Maraga, the Chief Justice and President of the Supreme Court of Kenya at the launch of Performance Management and Measurement Understandings Evaluation Report on 8th of June, 2017. Speech by the Hon Mr. Justice David K. Maraga, the Chief Justice and President of the Supreme Court of Kenya, during the Court Annexed Mediation Media Breakfast meeting. Chief Justice Talking Notes during the 4th Judiciary Annual Sports Day, at the Kenya School of Monetary Studies (KSMS), May, 26 – 27, 2017. Chief Justice’s Talking Points at the Council of Governors Luncheon, Hilton Hotel, Nairobi, 22nd May 2017. Remarks by DCJ during the International Association of Women Judges (IAWJ) 2017 Africa Region Conference held in Nairobi. CJ remarks during the official opening of the IAWJ Regional Conference, Nairobi. CRJ paper presented during the International Association of Women Judges Conference held in Nairobi. Key Note Address by the Hon. Chief Justice during the launch of the JCE 2016 Annual Report and IDLO Lessons’ Learned Brief Held At Supreme Court Gardens, On 4th May 2017. Chief Justice David Maraga speaks at the Annual Journalism Excellence Awards (AJEA) Gala, at Hotel Intercontinental, Nairobi, May 3, 2017. Remarks By The Deputy Chief Justice of The Republic of Kenya and Vice-President of The Supreme Court, Lady Justice P. M. Mwilu During The Launch of The National Gender and Equality Commission Report on “The Drivers of Child Pregnancy in Kenya” 25th April 2017, Laico Regency Hotel, Nairobi. Remarks by the Deputy Chief Justice Lady Justice Philomena Mbete Mwilu during the opening of the CWAG-AG Kenya seminar on Human Trafficking and International Organised Crimes. April 12, 2017, Windsor Golf and Country Club, Nairobi. Speech by the CJ at a conference on decriminization and re-classification of petty offences in Kenya. Remarks by Lady Justice P. M. Mwilu, The Deputy Chief Justice of the Republic of Kenya and Vice President of the Supreme Court at the 2nd Annual Legislative Summit 19th to 23rd March 2017, Mombasa County. Remarks by Deputy Chief Justice and Vice-President of the Supreme Court, Lady Justice P. M. Mwilu during the opening of the 4th Annual Devolution Conference 7th to 9th March 2017, KWS Training Institute, Naivasha. Remarks by Registrar Magistrates Courts Hon Peter Mulwa during the training of Magistrates on Election Disputes Resolution Preparedness. Remarks by Deputy Chief Justice of the Republic of Kenya and Vice-President of the Supreme Court, Lady Justice P. M. Mwilu during the inauguration of the High Court and Environment and Land Court, Makueni Law Courts. March 2, 2017. DCJ remarks during the launch of CJ’s Strategic Blueprint. CJ speech during the launch his Strategic Blueprint. Chief Justice David Maraga today, during the swearing in of Ethics and Anti-Corruption Commission Chairperson Rev Eliud Wabukala. CJ speech during the launch of an audit report on Criminal Justice System in Kenya. 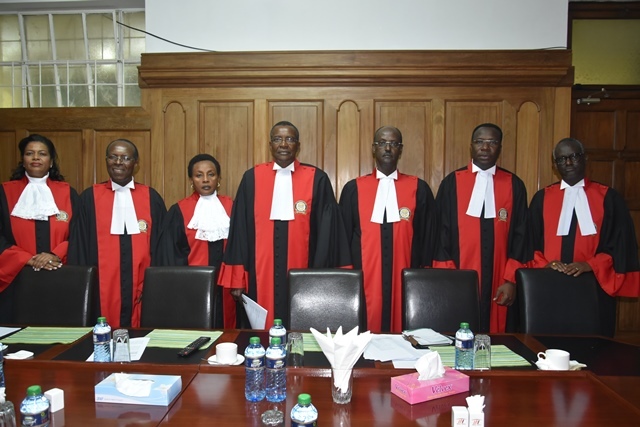 Remarks by Chief Justice David Maraga today, during the swearing in of the new Chairperson and Commissioners of the Independent Electoral and Boundaries Commission (IEBC). CJ remarks at the launch of the Commercial Law Guide Book. CJ speech at the opening of the 2nd Biennial Court Users Committees Conference at Utalii College, Nairobi. CJ remarks during the inauguration of the Narok High Court January 9, 2017.